Item # 139046 Stash Points: 5,995 (?) This is the number of points you get in The Zumiez Stash for purchasing this item. Stash points are redeemable for exclusive rewards only available to Zumiez Stash members. To redeem your points check out the rewards catalog on thestash.zumiez.com. 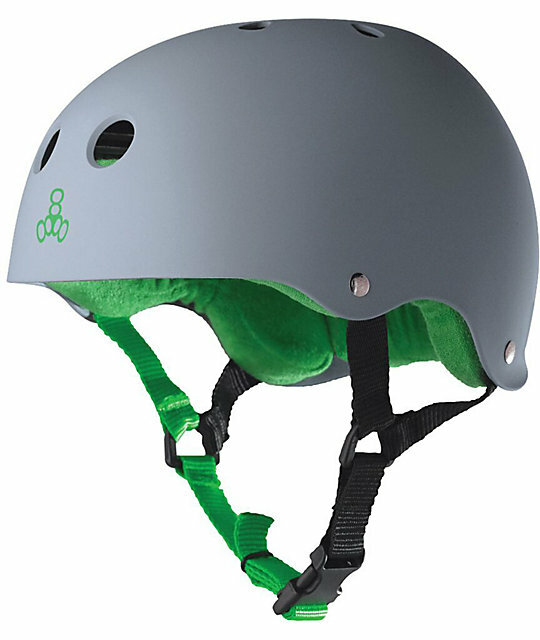 The Sweatsaver helmet from Triple Eight comes in a carbon grey colorway finished with green accents and a small Triple 8 graphic at the front. This helmet is made with a durable yet lightweight ABS outershell with a rubber finish, and features the stink-free moisture-wicking Sweatsaver liner for comfort. Sweatsaver skateboard helmet from Triple 8. Outer foam layer molds to your head for a comfortable fit. Stink-free moisture wicking Sweatsaver liner. Small: 55-57cm, Medium: 57-59cm, Large: 59-61cm.